YOU, you... God thinks about you. 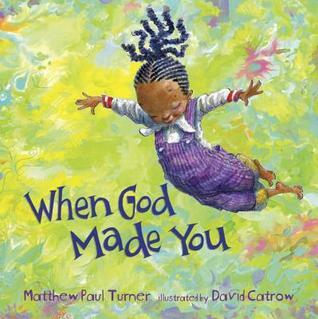 Through playful, charming rhyme and vivid, fantastical illustrations, When God Made You inspires young readers to learn about their own special gifts and how they fit into God's divine plan as they grow, explore, and begin to create for themselves. This book is wonderful! This would make a great gift and would be something I would buy for the little people in my life! The illustrations are fantastic and the meaning within the book is important for children to understand. Kids are special and made in the image of God and this book makes it very clear. Wonderful kids book, highly recommend!